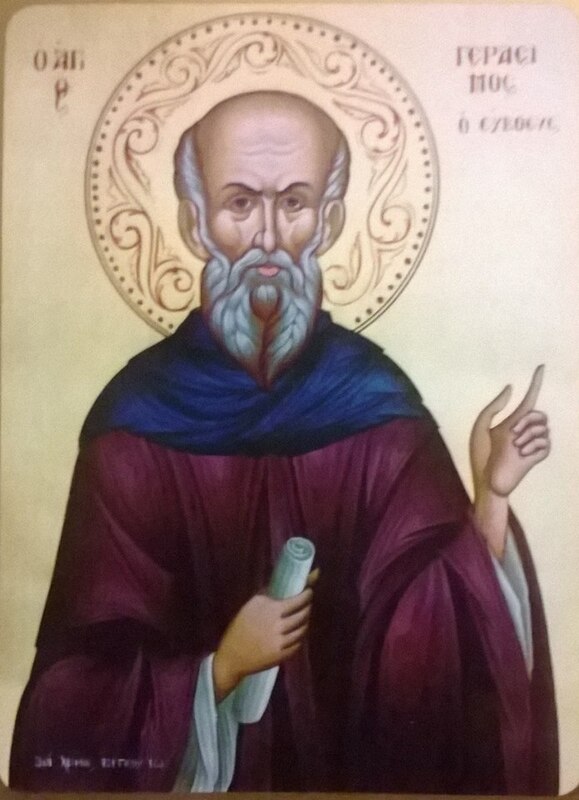 Saint Gerasimos was a missionary in Greece during the years of the Frankish occupation (around the 1320's). He was born on the island of Euripos, which was a name for the island of Evia (Euboea) in the Middle Ages. His parents were from the Western French family of Regas Fatzou. In the second half of the thirteenth century, Gerasimos went to the Monastery of Saint Katherine at Sinai. There he met the supremely virtuous Gregory the Sinaite, and became his disciple. In this way he attained great heights of praxis and theoria, so that he became an example and model of all good things and an image of virtue. When Gregory the Sinaite left Sinai, Gerasimos followed him to the harbor of Crete, from which Gregory departed for Mount Athos, and Gerasimos set off for continental Greece, where he worked as a missionary. Eventually he returned to his homeland of Evia as Monk Gerasimos the Sinaite.